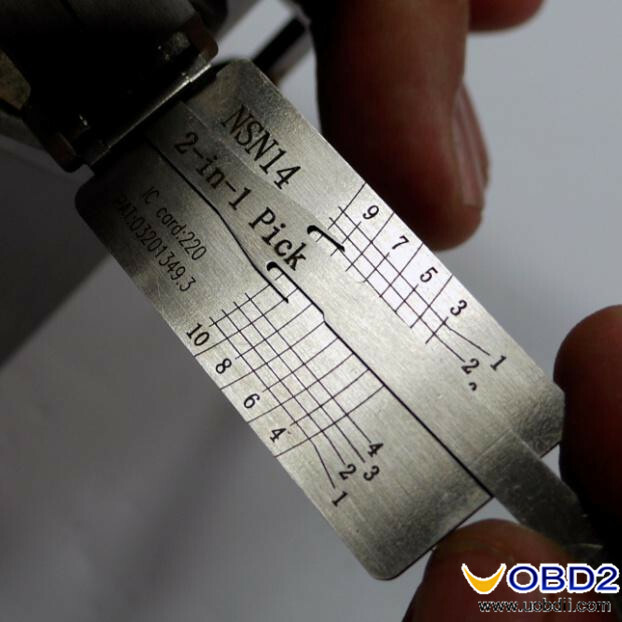 As Lishi auto lock tools are designed for use in door locks , there exists a number of models of car that do not house all of the wafer positions within the door lock , ie nissan NSN14 locks , these will house 8 wafers in the door lock but the full 10 wafers within the ignition . So once we have picked and decoded the door , it is necessary to progress the info we have in code software to find the 2 missing key cuts . in this part of the guide i attempt to show you how simple this procedure is . 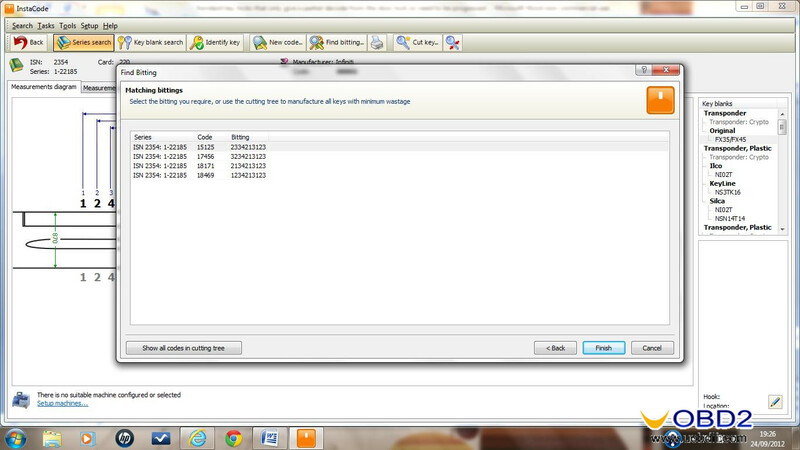 I use instacode as my chosen code software . As this guide is more about the progression than it is the picking , ive concentrated more on this . 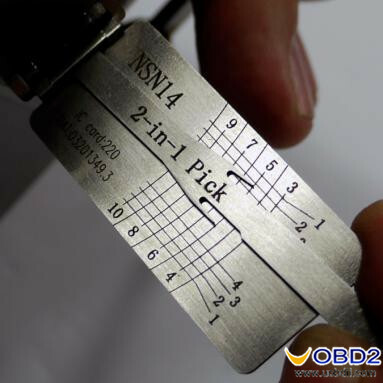 Picking and decoding the NSN14 lock using the lishi 2in1 single lifter then progressing the final 2 cuts using instacode . 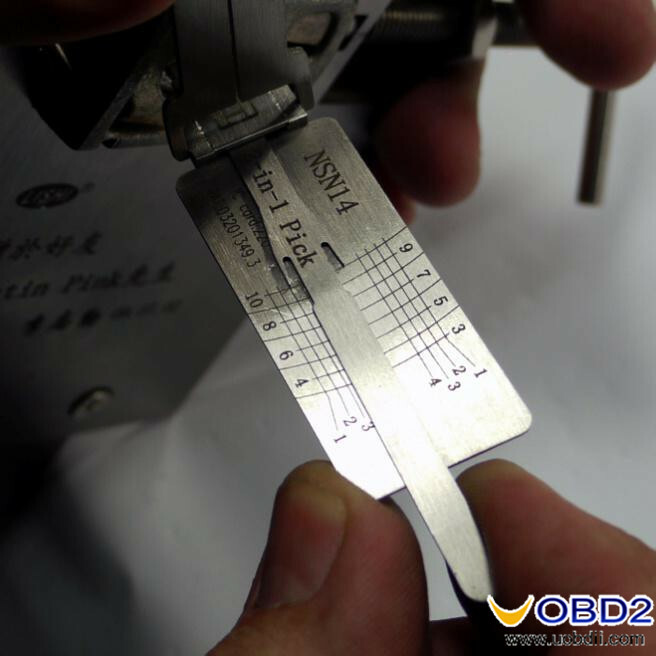 The door lock only houses 8 of the 10 cuts , the door lock houses positions 3 through to 10 . The door lock houses 8 wafer positions in positions 4 through 11 . 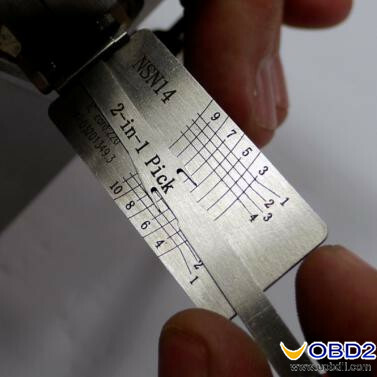 During this guide we will pick open then decode the Nissan NSN14 lock this will give us 8 of the 10 cuts required , we will then progress this info using instacode to find the missing 2 cuts and give us the correct 10 cut key . The lock doesnt always respond to sequence picking , but in tests it does favour picking positions 3 , 5 , 7 and 9 first then once set pick positions 4,6,8 and 10 . Center the lifting arm so it doesn’t snag and fully insert the tool into the door lock . 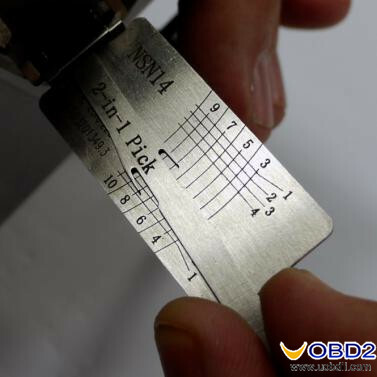 Once position 9 picks the plug is felt rotating a fraction which confirms positions 3 , 5 , 7 and 9 are fully set , i confirm this by checking each of these positions to ensure all are slapping tightly . 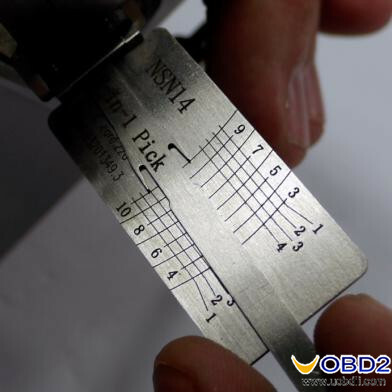 As position 10 picks the lock opens , as we didnt need to pick position 4 we know instantly that this is a No 4 cut . 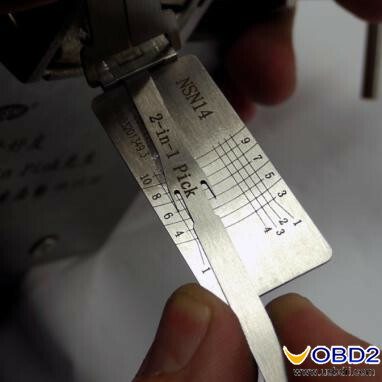 We now hold the lock in the open position via the tension arm , we then run the decode in the same direction as we picked , by moving the indicator arm along the vertical numbered position line , until the indicator stops , it will stop on one of the numbered horizontal key cut lines, this will be your key cut . 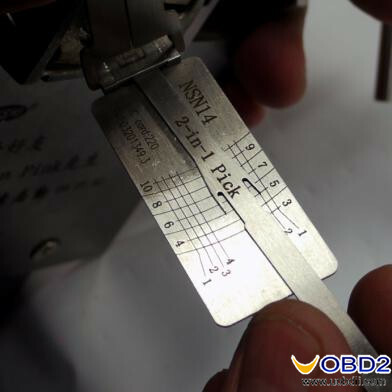 So we have cuts 3 to 10 from bow to tip of 34213123 , we now need to find the missing cuts for position 1 and 2 , we do this by using code software like instacode . 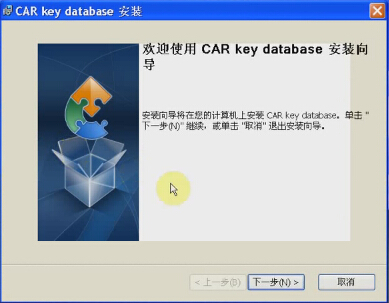 First we go to Instacode , we select either the car make and model and year or we choose silca nsn14 , we then select find bitting and enter the cuts we know in positions 3 to 10 which is 34213123 as in below diagram . You will see that we need a maximum of 2 blades as worst scenario . 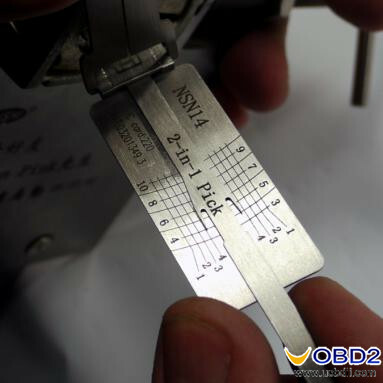 There are other ways to progress these without using 2 blades via impressioning , there are 2 ways of doing this , we will start with the scenario we have instacode and have the possible codes as above . So if impressioning , we cut the key on our cut to code machine as , 1134213123. Insert this key into the ignition and turn right and jiggle up and down , do this a few times . 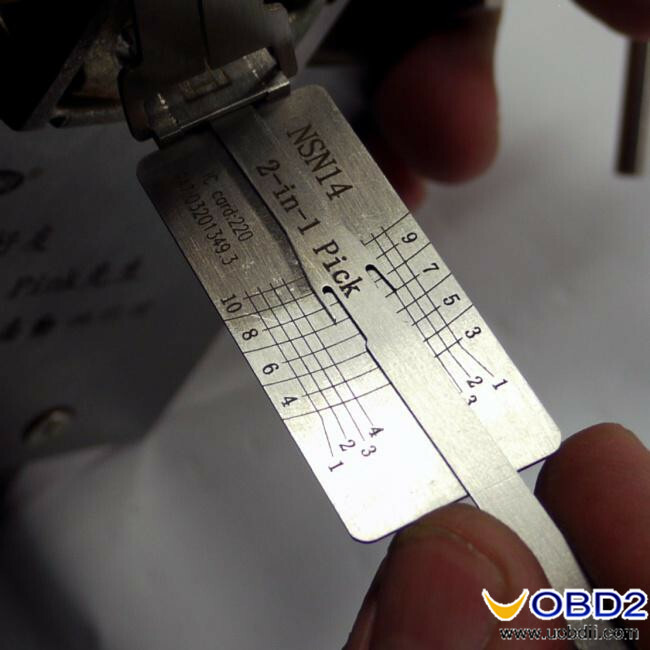 Remove the key and inspect positions 1 & 2 , we are looking for marks , if one position has marked , then this position needs cutting to next depth , if both positions have marked then both positions need cutting down . If using the info above if just the first position marked , then this confirms the 2nd position is a No 1 cut , so looking at what we have above , if position 2 is a 1 cut then it can only be code 18171 so we need to cut position 1 down to a 2 . If not having instacode , we cut each position that marks down 1 cut , we then clean with wet n dry , and reinsert into ignition , turn and jiggle again , we then inspect positions 1&2 again , any position that marks needs cutting down 1 cut again . Repeat this process and you will reach the correct key . Whether progressing via instacode or impressioning the last cuts its a quick simple process to complete . Once done we have the correct key for the lock . 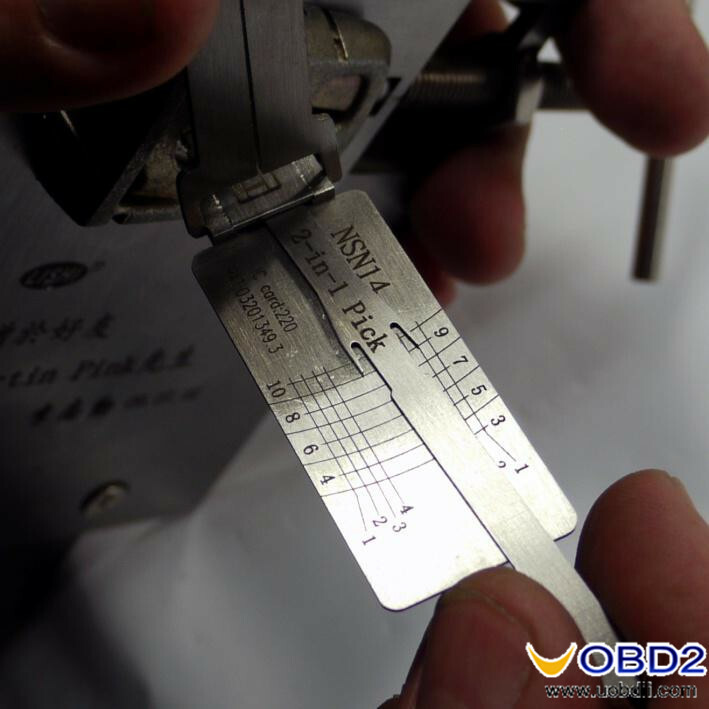 There will be no difference with regards the picking and decoding process of the door lock at all , other than remembering the positions marked on the tool will be incorrect. 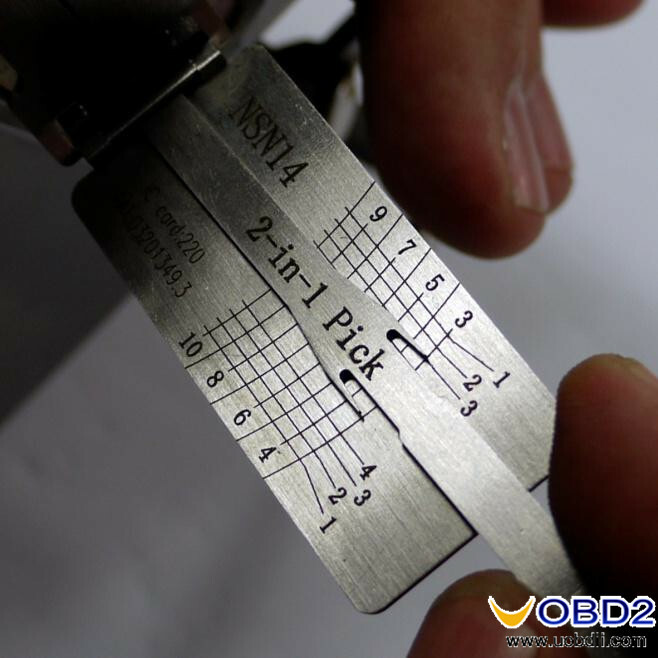 The tool will suggest you are picking and decoding positions 3 to 10 , when in fact you will be picking and decoding positions 4 through 11 instead , this wont affect the picking process , but will become important when progressing via instacode to find the missing cuts . 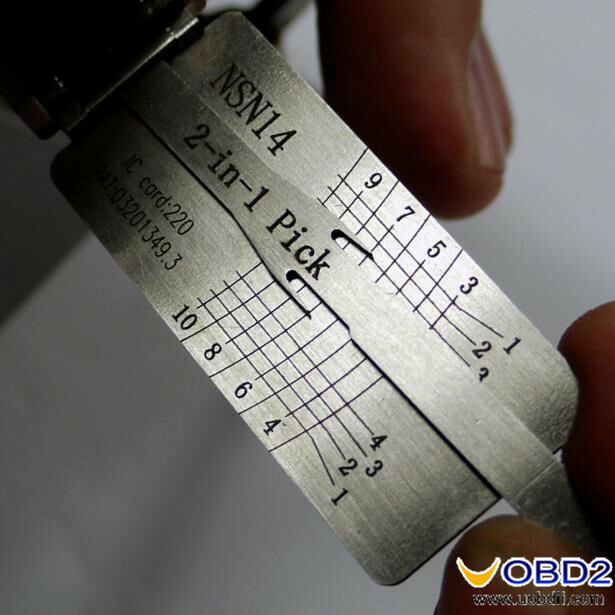 With our decoded cuts in the above guide of 34213123 , we would select the 11 cut NSN14 version on instacode , then select new biting , we would then insert the known cuts into positions 4 to 11 instead of 3 to 10 as before as in below diagram. 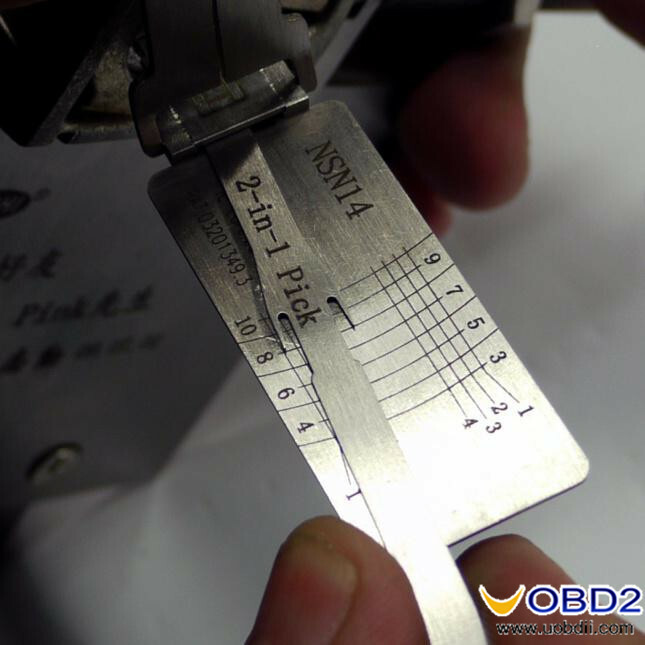 As you can see , the codes are identical to the above progression on the 10 cut key . 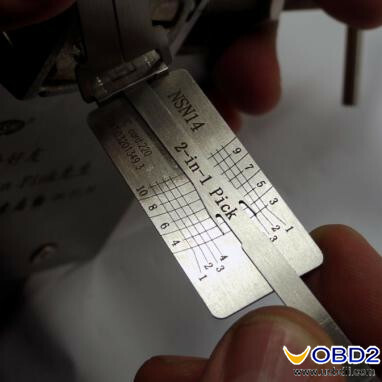 The only difference being that each one has a No 3 cut preceding it . This is because in the 11 cut lock , the 1st cut is a generic No 3 cut , this will be the same on every key for the current series . 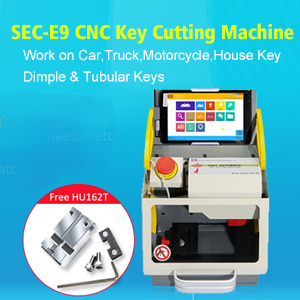 You wont always know if the car you are working on has the 11 cut powered eccentric ignition on it or not , this will only become obvious after you have cut the key , which will work fine in the door lock , but will fail in the ignition lock. This isn’t a problem , all we then need do is cut the 11th cut a No 3 cut at the bow end and the ignition will then operate.